Wood is prone to environmental changes such as temperature, moisture, winds, etc. Due to environmental changes wood tends to crack, decay, warp and damage. Also due to said changes wood tends to decrease its dimensional stability and strength. This happens because wood is attempting to match the environmental changes. As this is a natural process, wood splitting, warping, cracking cannot be totally prevented. However, this process can be slow down by applying wood stabilisers. 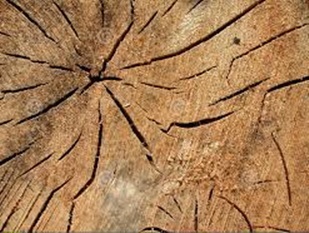 Splits and cracks occur when wood shrinks as it dries. Wood shrinks roughly twice as much along the growth rings as it does across the rings and it is this uneven shrinkage that causes cracks to develop. Splits and cracks in wood are ruptures or separations in the grain of the wood which reduce the quality as measured by appearance, strength, or utility. It is the extent to which a given material resists changes in dimension with variations in environmental factors. Wood, however, although little affected by changes in temperature, changes considerably in volume (shrinks and swells) with variations in moisture content. Wood if green or dry is soaked in wood stabilisers for an appropriate period then wood does not shrink appreciably when dried. Equally important, wood thus treated and then dried swells very little when exposed again to high humidity. Wood stabilization is a system of impregnating wood with chemicals to form a hard and tough surface. Stabilized wood is generally easier to turn, sand, and polish than unstabilized wood, particularly spalted and punky woods. Stabilizing enhances grain appearance, increases water-resistance, and the increased hardness helps resist scuffing and scratching. Wood products change and warp depending upon the temperature and humidity. If you want to reduce the chances of this happening, you can stabilize the wood with chemical treatments. Doing this will add weight and harden. Woodstab 919 is high Performance Wood stabilizer quick drying liquid formulated to strengthen and reinforce decayed or rotting wood. Woodstab 919 penetrates deeply in to the wood and binds and reinforces the decayed wood fibres. Woodstab 919 great performance wood stabiliser seals wood from further cracking, warping or damaging. Woodstab 919 increases dimensional stability of the wood. Woodstab 919 enters the fine structure of the wood by diffusion, thus application of pressure is of little value. The large molecules of the chemical displace the natural moisture in the microscopic, lattice-like structure of the wood- fibre walls. The wood is permanently restrained from shrinking, swelling, or warping regardless of atmospheric humidity. Time for dipping application depends on species of the wood, moisture contents, cracks, etc. Recommended time for dipping is around 8 to 72 hours depending above factors stated. Data presented in this document is in good faith and accurate and best to our knowledge. The data is submitted for information purposes only and without warranty whatsoever.We do not accept any responsibility or liability which may result from the use of this product. This is due to the nature and application of this product.The use and handling etc. of this product are beyond our control. Hence, we do not accept any Responsibility and liability.